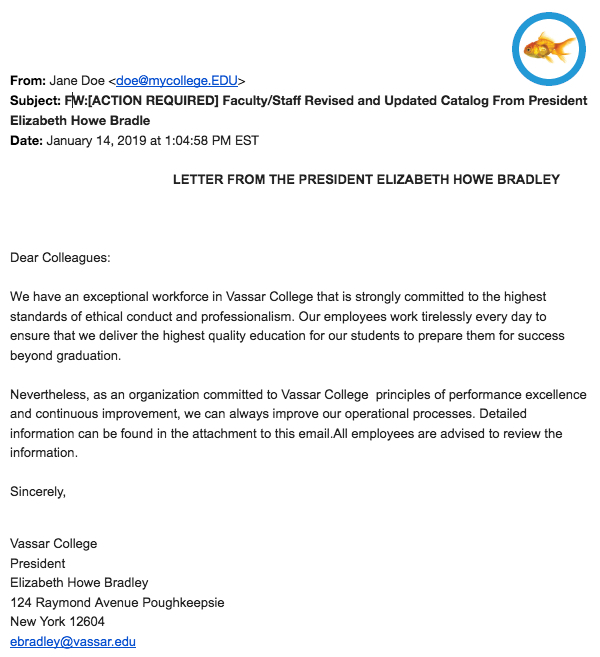 Over the last few days, we have received reports of email messages claiming to be from Vassar personnel. These messages come from outside email addresses, not from a vassar.edu address. The messages ask the recipient to reply quickly for an unspecified favor, or ask if someone is “available”. If you receive one of these messages, please email it to catchoftheday@vassar.edu and then delete it. If you engage the sender, it will lead to a fraudulent financial transaction. 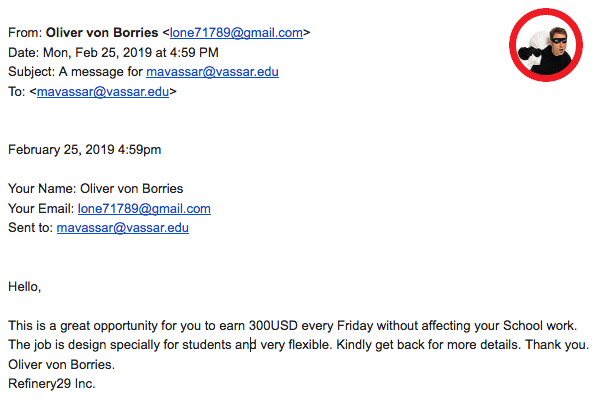 This email is from a criminal who is trying to steal money by impersonating a Vassar employee and targeting people within the person’s department or organization. The individual would try to convince the recipients to purchase a gift card and send back the redemption code. This is a common scam based on existing trust relationships among employees. Remember to always double-check the “from” and “reply-to” addresses in email to verify the sender. Thank you for your attention and thank you as always for reporting suspicious emails! The diligence from our community members keeps all of us at Vassar College more safe and secure. We have received multiple reports of email messages claiming to be from Carlos Alamo, Dean of the College. 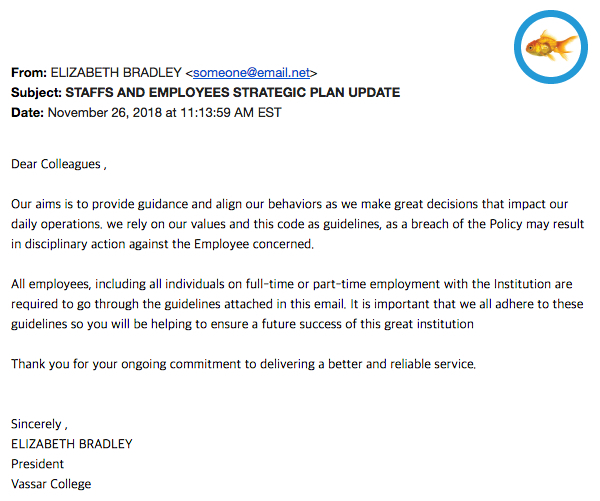 These messages come from an outlook.com address, not from a vassar.edu address. 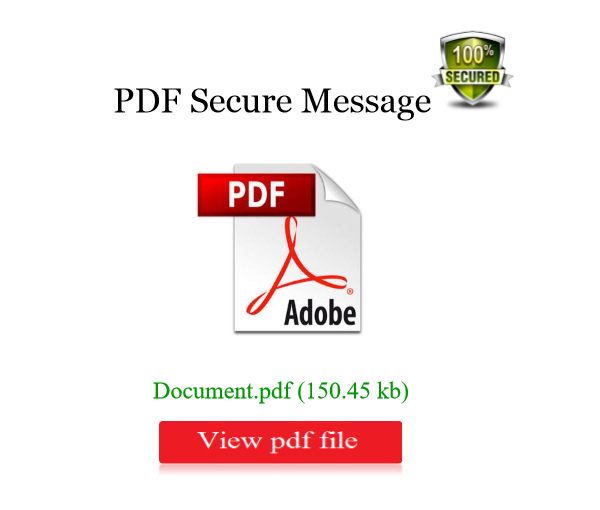 The message asks the recipient to reply quickly for an unspecified favor. If you receive one of these messages, please ignore and delete it. 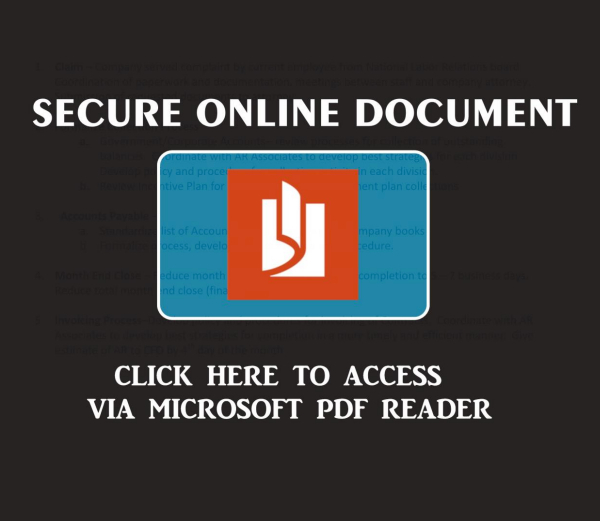 If you engage the sender, it will lead to a fraudulent financial transaction. This email is from a criminal who is trying to steal money. The individual would try to convince the recipients to purchase a gift card and send back the redemption code. 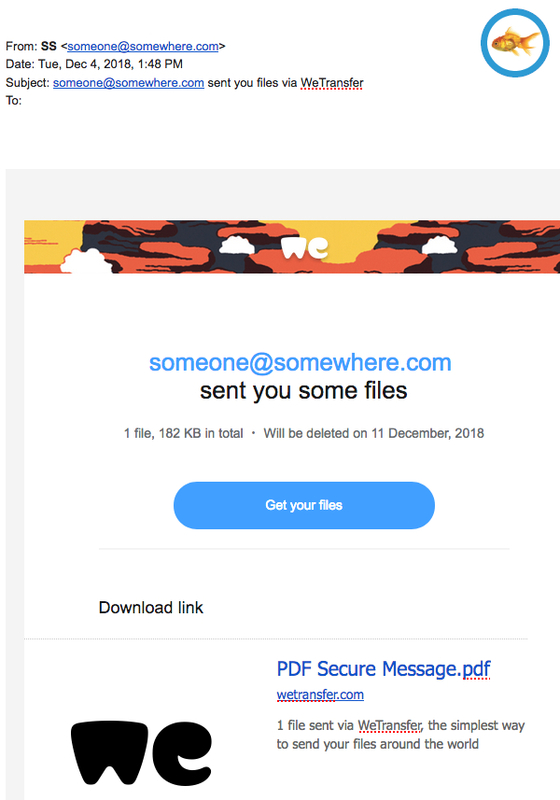 On January 17th, 2019, the media began reporting on a large collection of breached data, known as “Collection #1”. 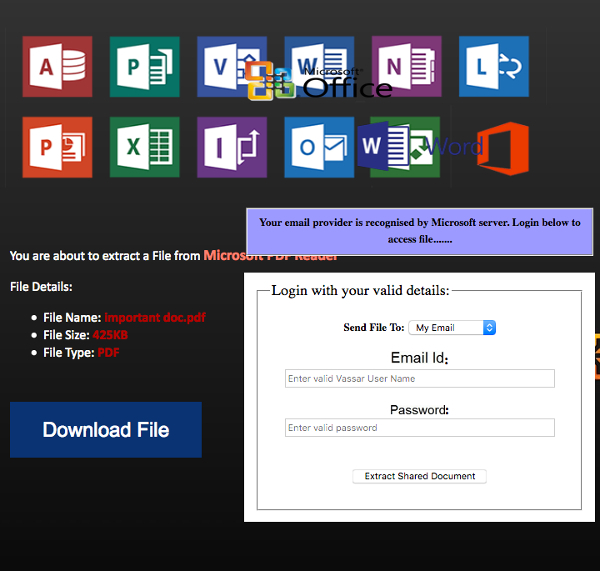 This collection contains millions of email addresses and passwords and was posted publicly on the Internet. The data was discovered by a security researcher named Troy Hunt. He posted a description of the data on his blog at The 773 Million Record “Collection #1” Data Breach. 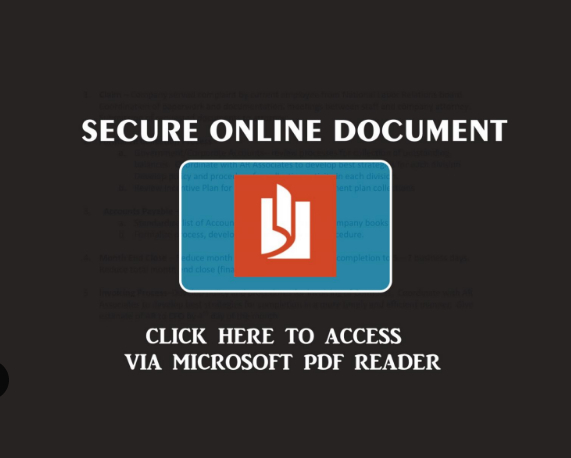 It is important to note that the breached data is not recent and that the information is limited to email addresses and passwords (i.e., no credit card information, health records or social security numbers). 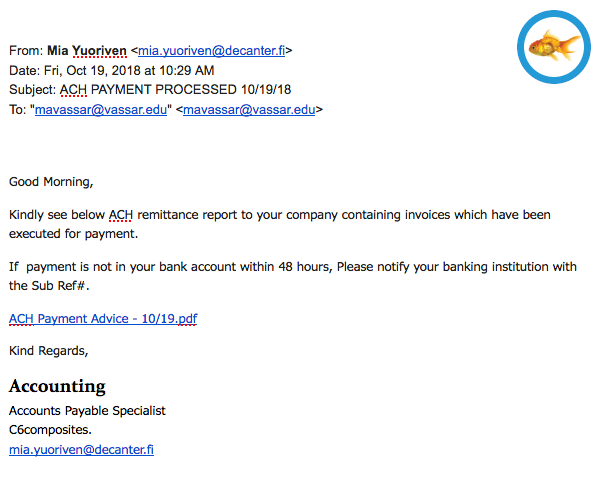 We do not believe this data contains any legitimate login or password information for accessing Vassar business systems. However, your Vassar email address may appear in the data collection when you used this email address to sign up for a third-party service. 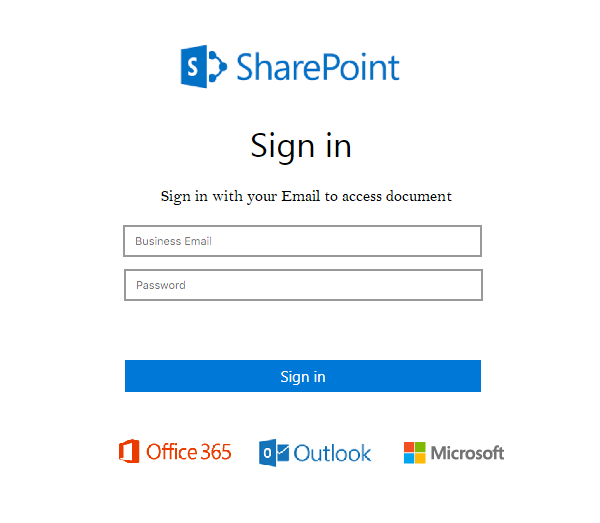 Check your email addresses for breaches – the website https://haveibeenpwned.com/ will tell you if your information is included in the “Collection #1” breach or any others. Vassar requires password changes once every year. This means the risk of your new password being known is low. 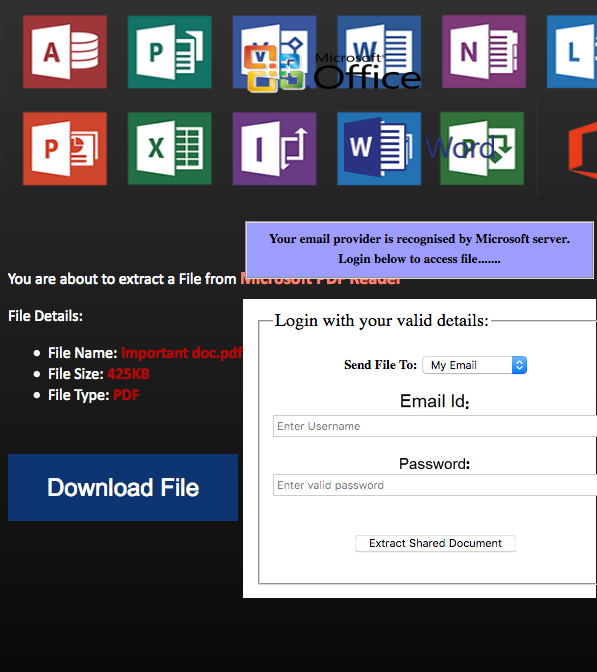 However, you should change older passwords on other websites if your email address does appear in the breach information. 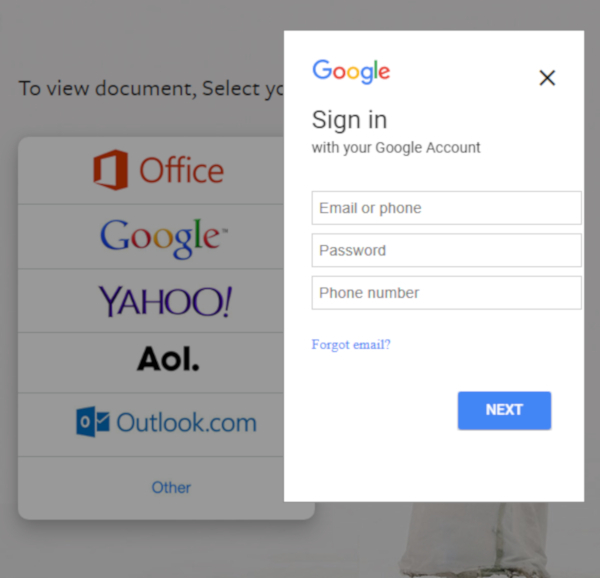 Enable Multi-Factor Authentication – Vassar offers Duo to protect many services, including Google Apps, Moodle, Workday, and Banner. Learn more at https://servicedesk.vassar.edu/solutions/571021-vassarone-setting-up-multi-factor-authentication-with-duo For your personal accounts, enable it wherever it is offered, especially for banking websites. If you have questions or concerns about this incident or any other Information Security topic, please send an email to infosecurity@vassar.edu. 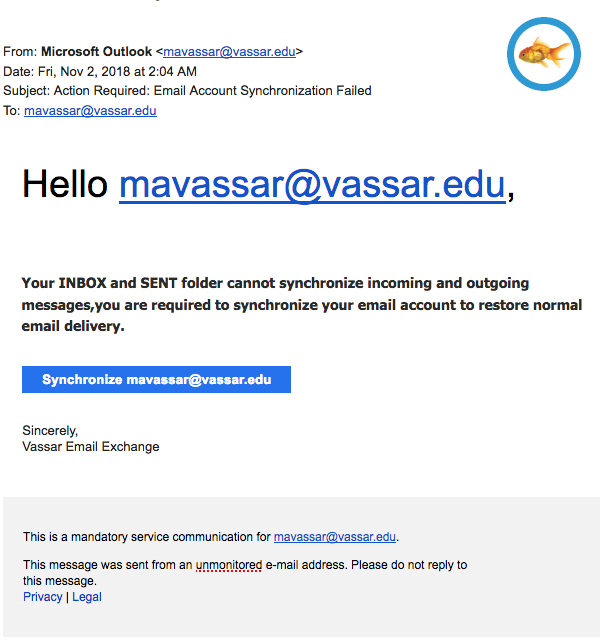 Always report suspicious emails to catchoftheday@vassar.edu. We have received multiple reports of email messages claiming to be from Jon Chenette, Dean of the Faculty. These messages come from a gmail.com address, not from a vassar.edu address. The message asks the recipient to reply quickly for an unspecified favor. If you receive one of these messages, please ignore and delete it. If you engage the sender, it will lead to a fraudulent financial transaction. This email is from a criminal who is trying to steal money. The individual would try to convince the recipients to purchase an Amazon gift card and send back the redemption code. Catch of the Day was inspired by the Phish Bowl, a project of Brown University.